Wednesday, I made this for dinner. We had it for leftovers Friday. And I have two more meals of it in the freezer! It’s delicious. So many flavors, and so fresh. 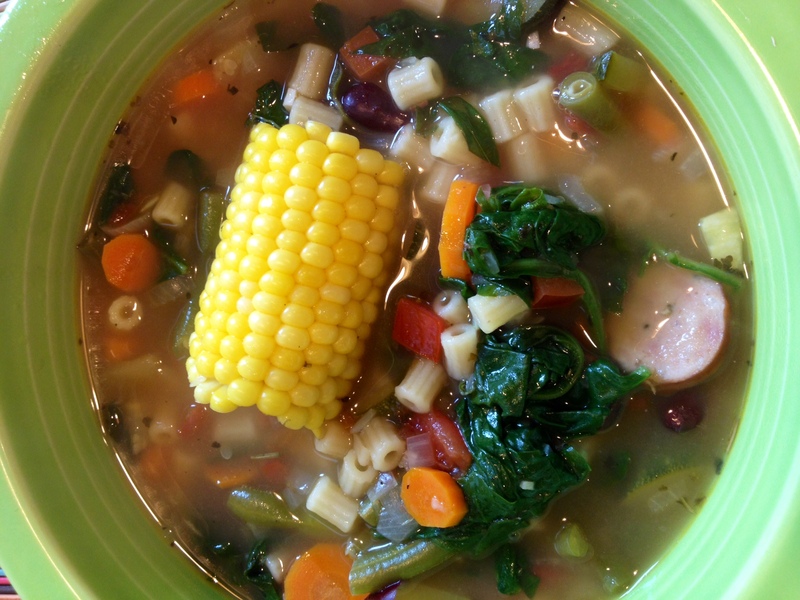 It’s Summer Minestrone from the August, 2014, Family Circle Magazine. Quick to cook, but took longer than 30 minutes to prep. Instead of the bullion cubes, I used about 8 cups of low-sodium vegetable broth. Loved the sausage in there, and all the veggies! Such a healthy meal. Next time I make it, I will leave out the pasta. I didn’t add anything to the taste, and I’d rather fill up on veggies instead. It cost me about $24 to buy the ingredients for this, and I figure that for the two of us, we’ll get about 5 or 6 meals out of it, including my husband having leftovers for breakfast Thursday morning. So this is not only a delicious and nutritious meal, it’s economical, too! Oh, one more thing. Make sure you use a BIG pot to make this, or cut the recipe in half. It makes A LOT! Twelve servings is pretty accurate, and they are not skimpy servings. Summertime doesn’t seem to be soup time, but this one is light yet satisfying. Packs a lot of energy in your bowl! Heat oil in a large soup pot over medium-high heat. Add onion and garlic; cook 3 minutes, stirring occasionally. Add carrots, zucchini, squash, green beans, corn, broth, tomatoes, Italian seasoning, salt, and pepper. Bring to a boil and simmer 3 minutes. Add pasta and cook 8 minutes. Stir in kidney beans and oregano. Simmer 2 additional minutes, until pasta is tender. If using sausage, add at this time. Gradually stir in spinach until wilted. Add basil. Try this and let me know how you liked it, and if you made any changes to the recipe.